For those cadets who signed up for poppy selling, you will be meeting inside the Bramalea City Centre by the RBC in the main concourse by the service desk and elevator. You will see the booth set up. All cadets will be participating in the Remembrance Day Parade for the Royal Canadian Legion Branch 609. Cadets will meet in the parking lot at Chingacousy Park by Queen Street and Central Park Drive (next to the fire station and the cenotaph). Cadets will meet at 0930hrs in C1 (full uniform with medals). They are encouraged to bring black gloves (either issued or civilian) and wear the parka if the weather is cool. The cadets will march with the parade to the cenotaph for the service. From there, they will march down Queen Street to the Royal Canadian Legion, Branch 609, where they will be dismissed. Parents are to pick their cadet up from the legion between 12 and 1230hrs. Light refreshments are provided by the legion for the cadets after the parade. Parents are more than welcome to watch the parade as it is a public service. We just ask that they do not interfere with their cadet while they are participating in the parade. The parade will go rain or shine. 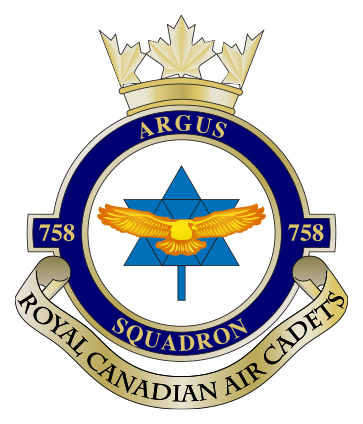 The 758 Argus Band will be performing during the second intermission of the game on Sunday, November 15, 2015 at 2:00pm at the Powerade Centre. We have reserved 60 tickets for the game for our cadets (cadets will sign up on Monday – no cost to cadets). If more than 60 cadets sign up, we will do a draw to determine who will go if we are not able to secure any more tickets. Returning cadets have now had ample time to complete any uniform exchanges but please continue to send appointment requests, if needed. Appointments will no longer be posted here as the supply officer is busy issuing uniforms to the new cadets now. He will call returning cadets down in between new recruits when he has time. Please ensure you bring with you any parts you need exchanged and be ready. It may take a couple of weeks before he gets to you. We still have a number of cadets who have not paid the annual $50.00 assessment fee levied by the Ontario Provincial Committee of the Air Cadet League of Canada. This was due back in September. Should there be an issue with payment, please speak with a member of our Sponsoring Committee who will exercise discretion and can work something out with you. All cadets are required to sell at least one book of lottery tickets. We do ask that that you pre-pay for the lottery tickets. As you sell them, you recover that money. Each book is $50.00. Many cadets have still not picked up their book of lottery tickets. Those who have picked them up, should be returning their sold stubs ASAP as they are now overdue!! This is a team effort and all are asked to participate as the money from these tickets not only directly benefits the squadron, but the cadet program overall. Should there be any issues, questions, or concerns regarding these items, please speak with a member of the squadron sponsoring committee who are typically located at the front door of Lions Hall during parade nights. Thank you to all those who came out to the fall FTX, although it most certainly felt more like winter. The weather was not ideal but we were all able to adapt and overcome and training continued. Our spring FTX is sure to have some warmer weather so we are looking forward to that one! As per the training calendar posted under Resources. Uniforms for new recruits are starting to arrive. The supply officer will call the names at opening parade for those he has full uniforms for. Returning cadets who have requested appointments will be called down if time permits on Monday as you have now had several weeks to sort any issues out. The new recruits will take priority. Be sure to take a look at the training calendar for a few important events coming up in the next few weeks. Remembrance Day is approaching as are some poppy campaign dates. Announcements will be made on the parade square regarding sign ups for poppies as we do not need all cadets but all cadets should be in attendance for the Remembrance Day parade. For those cadets who were unable to go gliding on the 26th of September because of bussing issues, we have a make-up date on 1 Nov as per the attached permission form. Please print and hand in as per the instructions on the form. Please note that the weather this time of year is very hard to predict. There is the possibility we may get weathered out, but our fingers are crossed!! Due to the weather, we will need to cancel drill for this evening. Band will still meet at LHQ. Please read the following letters from our Squadron Sponsoring Committee with a couple of really important messages.